The Ares I-X test vehicle is continuing to undergo the business end of processing inside the Vehicle Assembly Building (VAB) – which includes the installation of its ordnance over the weekend. Meanwhile, Shuttle and Constellation managers are debating its October 31 launch date, due to the proximity of Atlantis’ preparations for her STS-129 launch from the adjacent Pad 39A. The Ares I-X Flight Test Vehicle is the first major flight test of hardware related to the Ares I Crew Launch Vehicle (CLV). Although it is based on a four segment first stage – as opposed to Ares I’s five segment booster – “areas of comparison” will be tested during I-X’s short flight off Pad 39B. These tests include the outer mold line (OML) geometry, aerosciences, trajectory, structural modes, flight control architecture, separation sequence, and relevant element differences. Five major hardware elements comprise the Ares I-X. These include the First Stage (FS), the mass and OML simulators of the Upper Stage (US) and Crew Module (CM)/LAS (Launch Abort System), the Roll Control System (RoCS), and the avionics – parts of which are located throughout the vehicle. The number one primary Ares I-X objective is to demonstrate control of a vehicle dynamically that are similar to the Ares I, using Ares I relevant flight control algorithms. The vehicles use the same overall architecture and augmentation approaches, enabling common design and analysis techniques. Despite the single-team approach to Ares I and Ares I-X GN&C, there are significant differences in the two vehicles that will mean the Ares I-X flight test results will not directly validate Ares I control laws. Instead, they will be used to validate and calibrate the design and analysis tools used to develop the flight control architecture for Ares I. The test flight is set to proceed despite the uncertainty surrounding Ares I’s future. Hearings in front of politicians in Washington D.C. this past week confirmed that Norm Augustine – in charge of providing options for President Obama – believes Ares I-X should launch regardless. With the more realistic October 31 launch target – a target that has been delayed numerous times during the build-up to the $400m test – engineers are on track for the rollout of Ares I-X, which will take place just a few days ahead of launch. Checkouts are continuing on the power up of the vehicle, which was successfully started a week ago, while testing of the vehicle’s flight control systems and the preparations for the installation of its ordnance have been in focus over the past few days in High Bay 3 of the VAB. “Ares I-X (VAB HB-3) (Pad-B) VAB HB-3: Powered testing and checkouts continue,” noted processing information on L2, before noting a rare processing issue during the flow. “During preps for power up a nonconformance was picked up to document that the GC3 archive server stopped communicating, a reboot corrected the problem. This was not a constraint to power up. “This server is used for FR1 personnel to view ADMS data. It is not used for any vehicle commands by flight controls as those are routed through RIC NR1. The team will evaluate and troubleshoot this problem later. 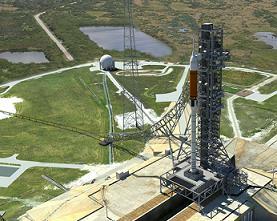 The current constraint will be to Launch Vehicle Readiness Test (LVRT). “TVC (Thrust Vector Control) actuator unpinned testing was completed. Flight controls testing was completed. RoCS channelization set-up complete, testing performed Friday. DFI (Detailed Flight Instrumentation) and Comm testing is planned (end of week through weekend). Also related to the launch, modifications to Pad 39B are nearing an end, as it transforms for a shuttle launch pad into the launch site for Ares I-X. Once Ares I-X launches, work will pick up on additional pad modifications for Ares I itself, which will include the massive undertaking of a rollercoaster EES (Emergency Escape System) being built on site. While the processing flow remains on target for the Halloween launch, a potential conflict with Atlantis’ STS-129 launch is being evaluated by managers. Currently, Atlantis is set to launch around two weeks after Ares I-X, which means she will already be on Pad 39A when I-X lifts off for Pad 39B on its suborbital flight. Considerations include a failure of Ares I-X – especially during very early flight – which in turn would threaten Atlantis just a short distance away. “Regarding launch date planning: the 5R (MRM) launch from Russia will stay at November 10. This means that the launch of STS-129/ULF3 will remain at November 12,” noted Shuttle manager John Shannon on the latest Shuttle Standup/Integration report – available on L2 – outlining the STS-129 launch window based on their discussions with the Russians. 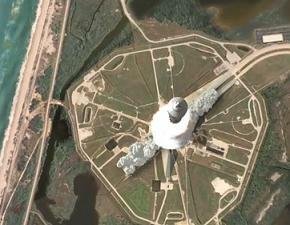 “The goal now is to have a launch window of November 12-16. “There is a great deal of discussion between the SSP (Space Shuttle Program) and the CxP (Constellation Program) on how to handle the Ares I-X launch in the same time frame. “The team is concentrating on several areas: 1) if there is an issue during launch, what is the probability of impact if the Shuttle is on Pad A and the Ares I-X is on Pad B – more Range information will be in by mid-October. 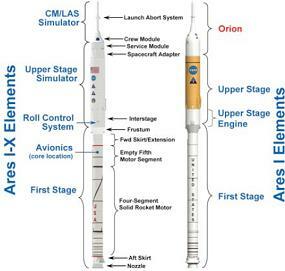 If range evaluations show a potential threat to Atlantis, managers will likely slip Ares I-X to after STS-129’s launch. Ares I-X obviously would not be affected by the Beta cutout that kicks in on November 20.